The vaulted foyer brings a touch of drama to this country home. The great room features a fireplace and easy access to the spacious covered porch. A counter peninsula divides great room and kitchen. Large windows and access to the back porch lend a feeling of spaciousness to the master suite. A skylight and bay window in the bath echo the theme of natural light. 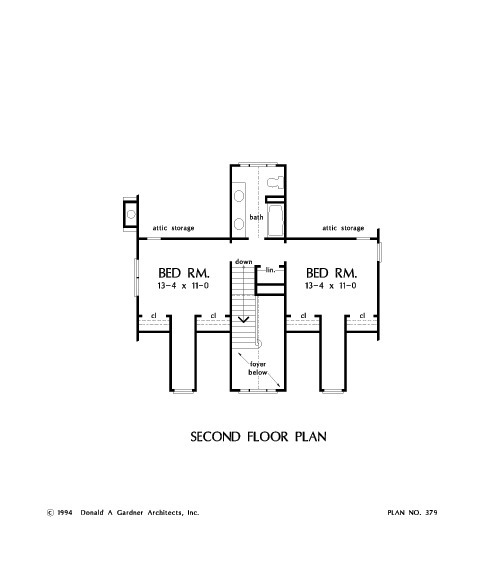 Two upstairs bedrooms share a bath with vaulted ceiling. A skylit bonus room and attic storage complete this plan. 1st Floor: 1448 Sq. Ft.
2nd Floor: 604 Sq. Ft. 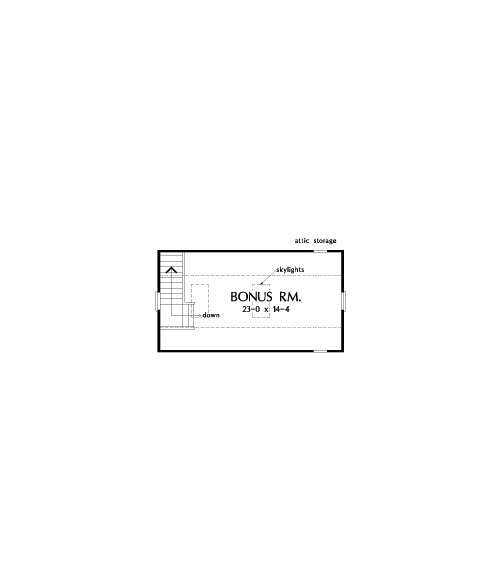 Bonus Room: 363 Sq. 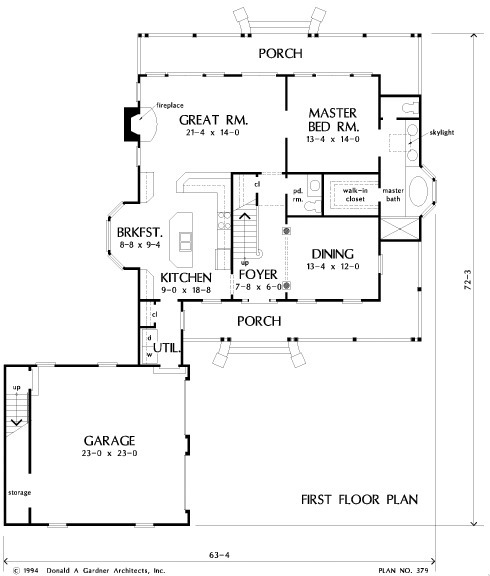 Ft.
House Dimensions: 63' 4" x 72' 3"
Great Room: 21' 4" x 14' 0"
Master Bedroom: 13' 4" x 14' 0"
Master Bedroom : 13' 4" x 14' 0" x 9' 0"
Bedroom #2 : 13' 4" x 11' 0" x 8' 0"
Bedroom #3 : 13' 4" x 11' 0" x 8' 0"
Porch - Front : 35' 2" x 6' 0" x 0' 0"
Porch - Rear : 41' 8" x 6' 0" x 0' 0"
Foyer (Vaulted): 7' 8" x 6' 0" x 21' 3"
Dining Room : 13' 4" x 12' 0" x 9' 0"
Great Room : 21' 4" x 14' 0" x 9' 0"
Kitchen : 9' 0" x 18' 8" x 9' 0"
Breakfast Room : 8' 8" x 9' 4" x 9' 0"
Utility Room : 6' 0" x 9' 3" x 9' 0"
Bonus Room (Vaulted): 23' 0" x 14' 4" x 9' 0"
Garage : 23' 0" x 23' 0" x 0' 0"
Garage Storage : 3' 4" x 16' 8" x 0' 0"